You will be keen to whip up this super cute Crochet Hot Air Balloon Mobile Pattern and it is the sweetest idea ever. Be sure to check out the Pattern details now. 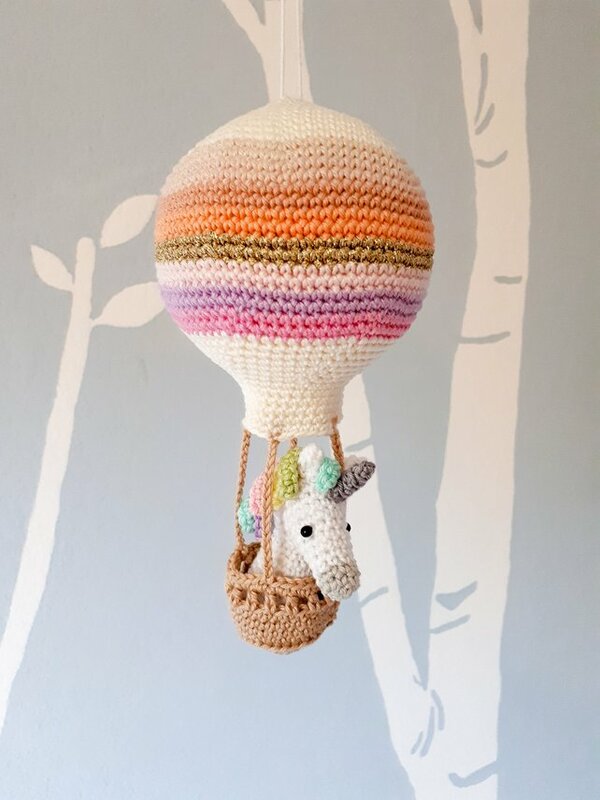 We were so excited to come across this adorable crochet hot air balloon mobile pattern. This creation comes to us from Birds And Crickets on Etsy and it’s a stunner. This would make the perfect newborn gift. Any expectant Mom would be thrilled to receive one, and according to the creator, it’s an extremely simple crochet pattern. This crochet hot air balloon mobile pattern would be the perfect addition to your baby’s nursery. With its colorful hot air balloons, it has 4 cute animals dangling from the baskets. Included are an elephant, tiger, zebra, and giraffe. Those friendly faces will keep your baby mesmerized for hours on end. We absolutely love this crochet hot air balloon baby mobile pattern and the creator now has the mobile in Unicorn form too. and if you would prefer, you can also purchase one readymade. We have included links below. You can find the Pattern here. If you would like to purchase the above mobile, you can find the details here.